Bigger isn't always better. But in the case of 1995 Topps Empire Strikes Back Widevision, it is. Following on the heels of the popular and well-received Widevision set based on the original film, Topps quickly set out to complete the trilogy. The result is a nice compliment that's simple in structure and holds up as one of the better sets of Star Wars trading cards. Embracing a larger tall boy format, the cards are over-sized. But this works in the set's favor as it enables to images to be showcased as they appear on the big screen. So while many of the images have been used in other sets, the new dynamic makes them seem fresh again. They also use remastered images that make everything extremely vivid. The 1995 Topps Empire Strikes Back Widevision base set is a relatively large 144 cards. Fronts are predominantly the a still from the film. The top and bottom have thin purple borders. The caption simply states where the scene takes place, making them sort of like storyboards. Backs aren't quite as busy or as informative as the first set, but there is still a lot to them. The coolest part of them is a second image that offers a behind-the-scenes look at the film's production. Packs only have one insert, Finest Chromium. Inserted 1:12 packs, they offer a chrome spin on the iconic production artwork of Ralph McQuarrie. A complete set has ten cards. 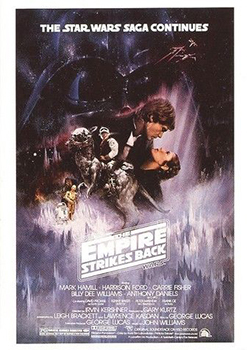 Every box of 1995 Topps Empire Strikes Back Widevision also comes with one of six mini posters. These show various versions of the movie posters as well as one for the radio drama. 144 cards. Shop for sets on eBay. 10 cards. Inserted 1:12 packs. 6 cards. Inserted one per box. I have some cards and never seen before would like to get them to someone collecting and get my money back I bought them to help a friend he doesn’t want them back but I’m not a Star Wars buff . If you know someone. I can send pictures.